I been following this company on Facebook for quite a while and been so tempted. I've grown fed up with tasteless plastic packed veggies from supermarkets, tending to opt for picking some up from the marketplace but then that means making a trip into the town centre, paying for parking and trudging through the litter congested Rows. Gorleston Veg Box Company is a local family run business who buy and delivery on the very same day, making sure what you get is the freshest possible. They sell fruit, veg and eggs from local growers and offer 3 different sized variety boxes with FREE delivery. Prices (click to follow the link for more details) are keep reasonable and they offer discount on regular orders. Each box also has FREE complimentary fresh herbs and 2 recipe cards to give you ideas on what to make with your order. I placed my order on Monday with Darren and waited excitedly to see what I would get. Delivery days are Thursday - Gorleston, Gt Yarmouth and surrounding areas, and Friday - Lowestoft and surrounding areas. At just gone 2pm on Thursday I heard a knock at the door. The order is delivered in wooden pallets, with minimal packaging. Everything was lose except for the Mushrooms and new potatoes. This was a medium box which contains 2kg of potatoes (regular and new) plus 7-8 other items and cost £12.25, the girls excitedly unpacked the contents. As you can see there was plenty packed in to the pallet! In addition to this I found two recipe cards, these are included in each delivery and vary depending on the contents. I received one for Broccoli and Stilton Soup and another for Rhubarb Brûlée. (I shall be blogging these recipes in the near future so keep your eyes peeled!) Also an information leaflet. 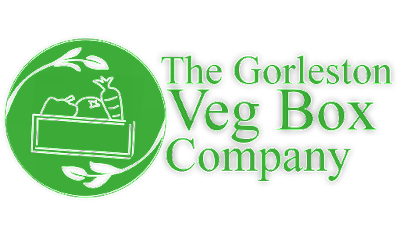 If you're wanting to find out more information or to place an order then check out The Gorleston Veg Box Company's website, follow them on Facebook or Twitter. Alternatively you could always do it the traditional way and pick up the phone!